The fervour gripping the nation during the IPL cricket season is about to die down as it draws to a close on May 27. While the ups and downs for cricket teams get publicised, what generally goes unnoticed is how the trash generated is managed. 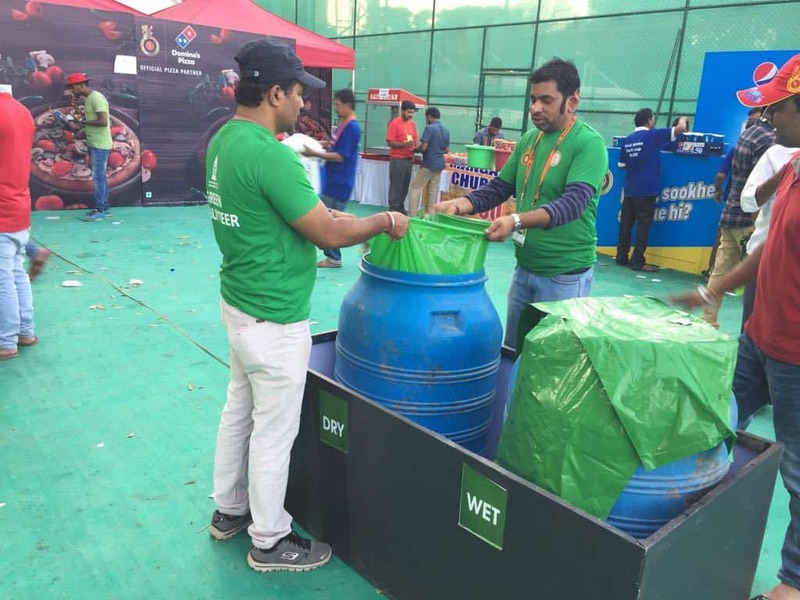 Bengaluru has led the way in showing other cities and cricket match organisers how waste can be handled in a scientific, sustainable manner. The seven matches played and hosted by them this summer at Chinnaswamy Stadium drew an audience of minimum 40,000 people on all days with each match generating garbage of 6.5 tonnes, according to an NGO working in the field of waste management, SAAHAS which handled the event in previous years. This year as avid spectators thronged the stalls consuming various food items and littering the grounds, the 11 volunteers and 112 workers employed by another waste management company, Hasirudala Innovations, were present throughout the matches collecting the plastic waste as it was thrown. Together, they were on their toes, constantly making sure that people enjoyed the match in clean surroundings. Interestingly, the volunteers were professors of MS Ramaiah Institute of Technology. The team had Professors Jyithi Laksmi, Rajendra, Lokesha K, Chandrashekhar, Pavan and a first year student Nikhil, N S Ramakanth of Solid Waste Management Round Table and citizen activist Mohan Govindaiah. Among others were ayurvedic medicine manufacturer Pushparaj, electrical contractor Nagaraj, GM of a construction firm Amre Gouda and software engineer Mahesh. Assistant Professor Lokesh said that at first they were at sea trying to understand how to handle the task, and gathered speed with experience. Bruhat Bengaluru Mahanagara Palike (BBMP) Medical Officer of Health (MoH)Dr Sandhya and Ramakanth gave them instructions on the list of plastic items to collect (cups, plates, spoons and plastic bottles), and biodegradable options that need to be kept separate while collecting them. The biggest hurdle was the replacement of the plastic bowls used by fruit-sellers inside the stadium with bowls made from areca leaves. As a result of several meetings with all stakeholders involved, plastic spoons used by all vendors were quickly replaced with wooden spoons from the second match itself..
Before the season commenced, meetings were held between stakeholders for three days consecutively on April 9, 10 and 11, at the BBMP head office and Karnataka State Cricket Association (KSCA). Many improvement measures were suggested. “Vendors of more than 80 stalls, representatives from DNA, the event management firm that manages cricket matches, and KSCA, were all educated about banned items and told about alternatives at the meetings to avoid mistakes,“ said Dr Sandhya. “We were careful not to block the view of the spectators and did not want to stay put inside the stands. We went on rounds by turn covering all stands except the hospitality stands, picking up plastic in 50 bags, made by Ramakanth sir himself. He made them from banners he found at the stadium and we reused them. We divided the stands and made two rounds each. Despite being professionals, we did not cringe even once while picking up waste with our bare hands. It was the enthusiasm displayed by the crowds that fueled us to keep going, sometimes till 1 am,” explained Lokesha. While they took care of the inside the stadium, the BBMP workers took care of the outside. Two hours prior to the match on April 13, three health officers working under Sarfaraz Khan, Joint Commissioner of Solid Waste Management, East Zone Health Officer Siddappaji, Senior Health Officer K Krishna Vardhan and BBMP Medical Officer, Health Dr Sandhya went on a plastic inspection along with a team of 8 pourakarmikas. They covered shops on MG road, Kasturba road and other areas within 1 km radius around Chinnaswamy stadium. They spoke to vendors using plastic and educated them about the harm caused to the environment. “Vendors selling T-shirts, banners, tea and fruits use plastic for packaging, which are later carelessly discarded on the street. We collected roughly 40-50 kgs of plastic per day. The BBMP apart from this has not shown a keen interest in managing the waste generated during the IPL season. The BBMP also lacks the man-power to handle to waste inside the stadium, leading them to take up plastic inspection,” said the octogenarian waste-management warrior who went with them, NS Ramakanth. 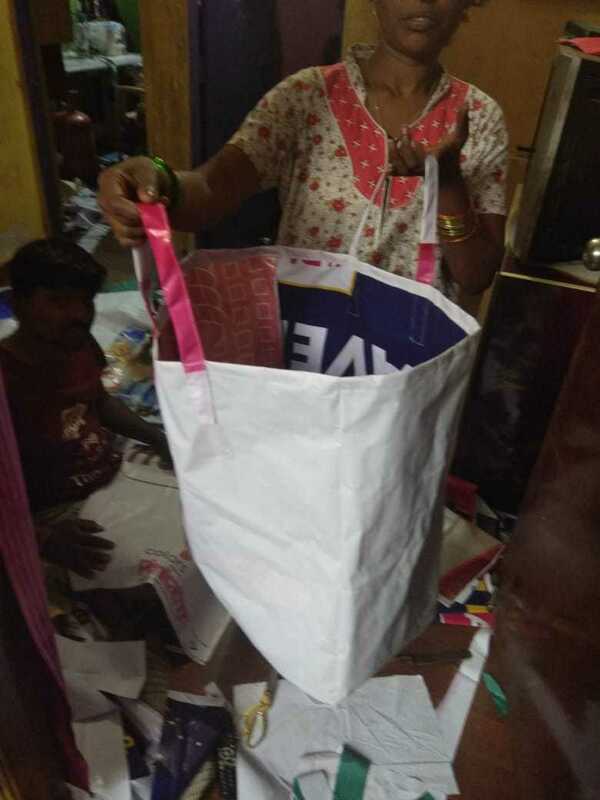 Hasiru Dala Innovations, a company that is into waste management, has handled bulk waste for events such as Pinkathon and Wipro Marathon successfully. For this reason, event management firm, DNA Entertainment Private Limited chose them this year. “Two dustbins, wet and dry, were placed at strategic locations in each stand. Humorous posters on cricket, prompt the crowd to think twice before throwing waste into a dustbin. Our 12 supervisors and 100 waste pickers are trained to ensure segregation is followed when an item falls on the ground or goes into the wrong dustbin,” said Managing Director Shekhar Prabhakar. Considering the needs of the comfortably seated audience inside the 8,000 seater hospitality stands, Hasiru Dala additionally provided housekeeping services. The Karnataka Cricket Associations Members lounge, the grand terrace, and an exclusive stand for owners and invitees of the teams comprise some of the 12 hospitality stands. The selected 100 waste-pickers were trained for high-end hospitality management, by the International Institute of Hotel Management and the Embassy Group. Colour-coded bags were diligently used for segregation; green for wet waste, yellow for liquid waste from the bar and blue for dry waste. The wet waste was sent to the biogas plant plant in Doddaballapur owned by Maltose Agri Pvt Limited. The plant located in Huskur can process 20 metric tonnes of organic waste, and is in turn used in producing biogas. The dry waste is also segregated once again into sub-categories at the godowns. The main categories of dry waste are plastic, paper, aluminium cans, polyethylene bottles, and tissue papers. 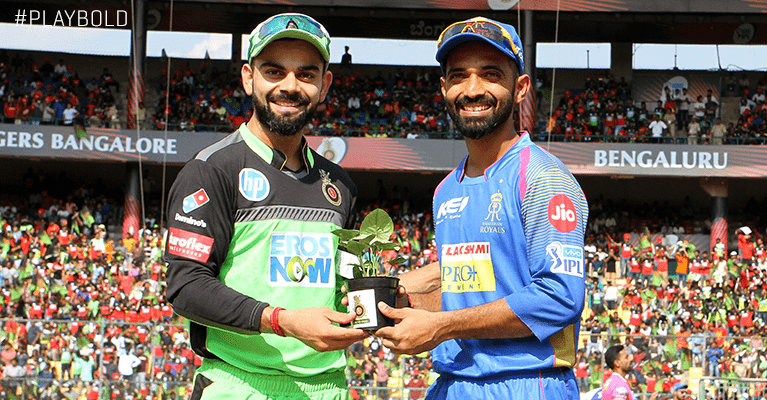 The data is compiled diligently in a template, and is sent to Good Era, a firm managing the carbon footprint of RCB, two days after each match. The weight of the waste, impact assessments considering number of trees saved and the quantity of plastic that can be recycled is calculated, thus making it a full-fledged carbon footprint assessment. However public and media are not privy to this information. There are lessons to learn too. The police deployed were not avoiding plastic water bottles and were yet to be educated on the matter. They ordered food from a hotel without the consent of the organisers. “The 1000 policeman on duty at the match ordered from an outside restaurant and went against the protocol by receiving food in plastic. We are planning to coordinate a specific vendor for their needs as well in future. An ice-cream vendor violated the protocol and used plastic. We will find a replacement for him during next match,“ said Dr Sandhya, detailing how follow ups are made at each step, to improve the eco-friendly quotient. “While the back-end can be organised, it is still imperative for waste to be generated and maintained in a segregated manner. Mixed waste prevents proper processing of waste. For example, if sambar (curry) is spilled onto a newspaper, neither the sambar nor the paper can be recovered. If you keep them segregated, ingredients of sambar can be composted or used in biogas production, and newspaper can be recycled. Therefore, participation of waste generators in this system is crucial, “ says CEO of Saahas, Wilma Rodrigues. Bengaluru’s IPL team Royal Challengers Bangalore (RCB) may not have won the cup, but they seem to be leading in eco-friendly initiatives. 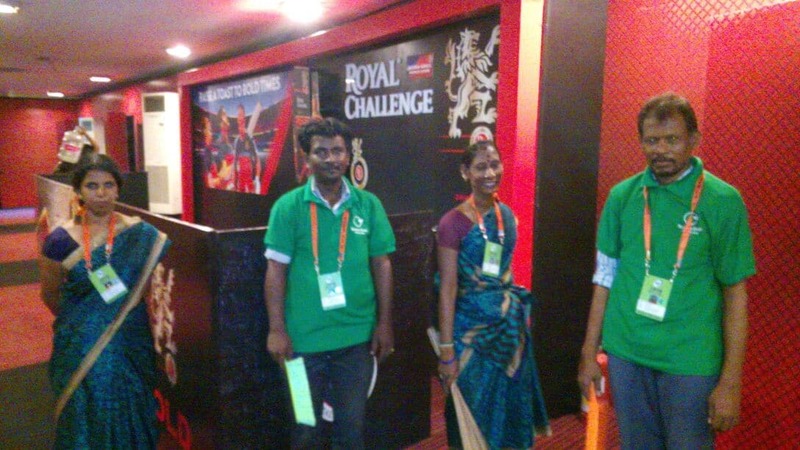 Every year, RCB chooses a day to host a Green Match event before the game commences. This time, out of the seven scheduled matches in the city, the event to spread environmental awareness was held on April 15. Amrit Thomas, Chairman of RCB told Citizen Matters via email that they distributed 10,000 saplings to eager spectators and encouraged the audience to plant trees this year. RCB has taken on a host of green initiatives in the past since 2010, including planting of saplings in government schools in Karnataka for Support-My-School campaign. The team claims to be holding the tag of the world’s first carbon positive cricket team for innovatively utilising wind energy on home turf. On April 15 2018, the team donned green T-shirts on the day of annual Green Match. The jerseys sported by RCB were made from recycled 11,000 PET bottles segregated from previous years T20 games hosted in Chinnaswamy stadium, said Amrit Thomas, Chairman of RCB.